If you haven't given your tax preparation information to your preparer yet, plan on getting an extension of time to file. Dividing community property information for spouses and RDPs. IRS gives penalty relief for underpayments of 2018 estimated income taxes. Penalty relief for new partnership income tax return requirement. Filing an extension isn't reporting a change of address. "Accidental Americans" in France file a discrimination lawsuit. Electric vehicle credit for GM vehicles to be phased out. Final regulations issued for Reportable Transactions. New requirement for requesting an employer identification number. 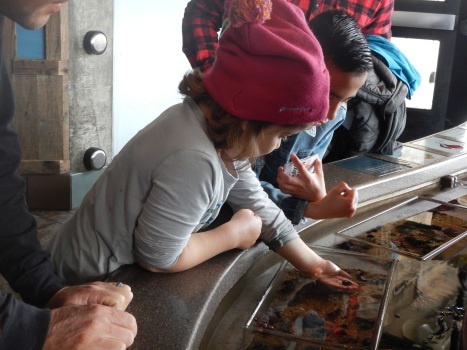 Minerva Siemer checks out sea life at the Monterey Bay Aquarium. Easter will be celebrated on April 21 this year. I prefer it when Easter falls after April 15, so I can enjoy the holiday without thinking about tax deadlines. Spring is already here, but I think of Easter as the beginning of spring. It's also a special family holiday for many people, as well as a religious holiday to think about making a fresh start, based on the resurrection of Jesus. Have a happy and safe holiday. April is a big birthday month for my family. My daughter and office manager, Dawn Siemer, her husband John and her daughter, Kara, all have April birthdays! Allen Le, Thi Nguyen's husband, is also celebrating his birthday this month. Happy Birthdays! The IRS will allow you to file an extension without paying the tax. You are still required to include an estimate of the tax due on the form. (The extension will not be accepted without this amount being entered.) The late filing penalty will be waived provided your income tax returns are filed on the extended due date, which is October 15, 2019 for most individuals. The first 2018 estimated tax payment for individuals and most other calendar year entities is also due on April 15, 2019. The penalties for late payment of estimated taxes are computed as simple interest, but the interest rate has been increasing. The federal estimated payment can be based on 25% of last year's tax liability California "front loads" the first estimated tax payment as 30% of last year's tax liability. California taxpayers with taxable income of $1 million or more must make their estimated tax payments based on their actual income and deductions. An extension form should be submitted with a payment of any estimated balance of tax by April 15. For help with your extension, call Ms. Thi Nguyen, CPA at 408-286-7400, extension 206. California and several other states have community property laws. In general, that means income earned from community property assets and the earnings of either spouse are one-half owned by each spouse or registered domestic partner (RDP). If separate returns are filed, it makes reporting more comples because one-half of the income and withholding from Forms W-2 (and certain Forms 1099) should be reported on each income tax return. The IRS has issued Form 8958, Allocation of Tax Amounts Between Certain Individuals in Community Property States, to allocate tax amounts for married persons filing as separate spouses or RDPs with community property rights, including income, deductions, credits, taxes and withholding. You can get the form at the IRS website, www.irs.gov. Since many taxpayers are discovering that they underpaid their 2018 estimated income taxes relating to changes in the Tax Cuts and Jobs Act of 2017, the IRS has announced it will waive the penalties for taxpayers who paid at least 80% of their tax liablity through withholding and estimated tax payments. The threshold is normally 90%. The waiver can apply even when the 80% payment was made on January 15, 2019. To request the waiver, file Form 2210, Underpayment of Estimated Tax by Individuals, Estates and Trusts, with the 2018 income tax return. Complete Part I of Form 2210 and the worksheet included in the instructions to determine if the waiver applies. If it does, check the waiver box at Part II, Box A, and include the statement "80% Waiver" next to Box A, and file page 1 of Form 2210 with the return. Be sure to download updates for your tax return preparation software, which should include this process. The IRS initiated a new reporting requirement on Schedule K-1 for partnership income tax returns for taxable years beginning after December 31, 2017. Partnerships are now required to report information about partners' negative tax basis capital accounts. Partnerships might not have the information readily at hand. For example, the partnership might not have the information about a partnership interest that was inherited and received a new tax basis as of the date of death of the deceased partner, or a partnership interest might have been sold and received a new tax basis. The IRS has announced that penalties for filing an incomplete partnership income tax return relating to this disclosure requirement will be waived provided the information is submitted to the IRS no later than 180 days after the extended due date for the partnership's Form 1065 or, for a calendar year partnership, no later than March 15, 2020. This penalty relief only applies for a partnership taxable year beginning after December 31, 2017 but before January 1, 2019. The information should be sent to Department of the Treasury, Internal Revenue Service, 1973 North Rulon White Blvd., Ogden, UT 84404-7843, MS 4700, Attn: Ogden PTE. The Tax Court found that the IRS's mailing a notice of deficiency to a taxpayer's old address was valid. The taxpayers claimed the IRS should have updated their address on its records based on an extension form and Form 2848, Power of Attorney form, that were submitted. The IRS sent the notice of deficiency to the taxpayers' last known address. The taxpayers would have avoided this issue if they submitted Form 8822, Change of Address, when they moved. Persons born in the United States are automatically American citizens, even though they might have grown up and live somewhere else. American citizens are required to file a U.S. income tax return, even though they live and work elsewhere. Under the 2010 Foreign Account Tax Compliance Act (FATCA), foreign banks are required to provide financial information for customers who are U.S. citizens abroad, or face possible fines. Some French citizens who are also U.S. citizens have been unable to open bank accounts or take out loans. 300 of them, called the Association of Accidental Americans, have filed a class action lawsuit, claiming discrimination because of the accidental citizenship status. Foreign residents can apply to give up their U.S. citizenship, but it is a long, costly process. The IRS has announced that General Motors has reached a total of more than 200,000 sales of vehicles qualifying for the plug-in electric drive motor vehicle credit during the fourth quarter of 2018. The tax credit will be phased out beginning April 1, 2019. The credit for qualified GM vehicles is $7,500 for purchases or leases before April 1, 2019, $3,750 for purchases or leases from April 1 to September 30, 2019, $1,875 for purchases or leases from October 1, 2019 to March 31, 2020, and zero for purchases or leases after March 31, 2020. Taxpayers are required to disclose certain reportable transactions and transactions of interest. If they fail to make the required disclosures, a penalty of 75% of the decrease in tax on the return as a result of the transaction can apply. The IRS has issued final regulations detailing the disclosure requirements. Reportable transactions usually relate to tax shelter transactions. A new requirement in the regulations is when the period of assessment is closed when a transaction becomes reportable, but also participated in the same reportable transaction during a year for which the period of limitations on assessment remains open at the time the transaction becomes reportable, the taxpayer is required to describe participation in the reportable transaction during the years for which the period of limitations is closed at the time the transactions become reportable. If you are involved in a reportable transaction, you really should have your income tax returns prepared by a CPA, enrolled agent, or attorney. These representatives should study these new regulations to be sure the disclosure requirements are met. The IRS has announced that, starting May 13, 2019, the procedure for applying for an employer identification number is changed. Only individuals with U.S. tax identification numbers may request an employer identification number (EIN) as the "responsible party" on the application, Form SS-4. The employer identification number is required for sole proprietors who have employees, partnerships, most LLCs, and corporations. This means that foreign individuals who want to conduct a business in the United States will have to apply for an individual tax identification number.